Spring is a magnificent time with lots of cute things. There is a simple task for you here. Empty the bright slots from nesting boxes, snails, flowers and potions to proceed to the next level. Don't use too many moves or you will lose! 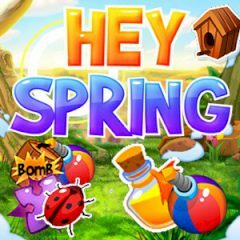 Do you want to solve some spring puzzles? We have one for you right now! Spring brings us some magnificent items such as nesting boxes, flowers, snails and even magic potions. All they fill the spring layout and you have to empty certain slots from those items. Use as less moves as possible to increase the amount of points in the end.